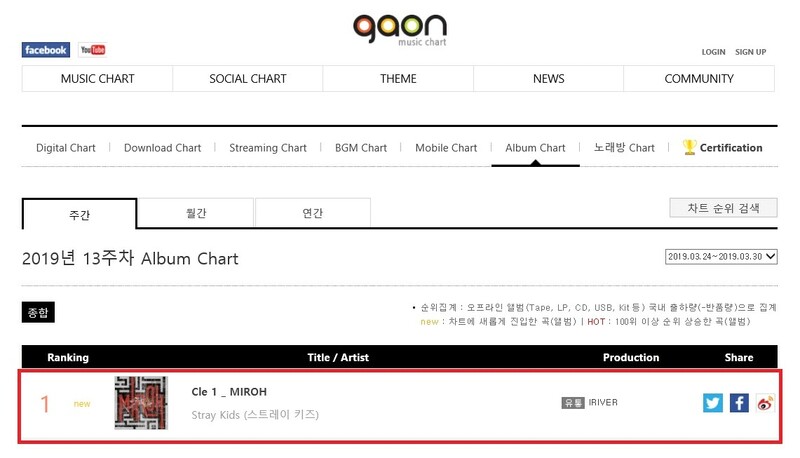 Stray Kids has proved their growth by topping the Gaon album chart. Recently, Stray Kids has become the first to enter Billboard's "Artist 100" chart, ranked third on the "WORLD ALBUMS" chart, fourth on the "SOCIAL 50" chart, and fifth on the "EMERGING ARTISTS" chart, proving the popularity of K-pop groups. Even before their official debut, Stray Kids was named the number one on Billboard's list of notable K-pop artists of 2018 TOP5 and was later recognized as the top rookie of 2018 by winning the "eight gold medals in rookie awards" at various awards in Korea. The new album "Clé One: MIROH" features the title track "Miroh," "Entrance," "Victory song," "Maze of memories," "Boxer," "Chronosaurus," "19" and CD-specific tracks "Mixtape#4. Following their previous works, Stray Kids also participated in writing and composing full-length songs, recording a wide range of musical spectra and strong passion. The music video for "Miroh" surpassed 28.61 million views as of afternoon on April 4, and is about to surpass 30 million views.